Government plans to build a 15,000-home "eco-town" in Oxfordshire have been met by criticism from the county council, local residents and a wildlife charity. Weston Otmoor, near Bicester, is one of 15 areas shortlisted for 10 new towns - the first in England in 40 years. The government rejected plans to build on a second site at Shipton quarry. Tennis star Tim Henman's father said he would continue to fight the plans for the "horrendous" Weston Otmoor, which would be next to his village. Developers Parkridge said the development would not only benefit future residents, but also those already living and working in the region, and would help fund the East West Rail link between Oxford and Milton Keynes. Roger Sporle, of Parkridge, said: "We are committed to making sure the proposals work at every level by involving all key stakeholders over the coming months." But Anthony Henman, 67, said he feared Weston-on-the-Green, near Oxford, home to him and his wife Jane for the past 40 years and where Tim grew up, would be ruined by the development. Mr Henman has founded the campaign group Weston Front, which has already earmarked a QC to present a case for a judicial review at the High Court if it becomes necessary. "This will destroy our village community as we know and enjoy it at the moment," he said. "We would suddenly have 20,000 people living next door which would be like living in a town. "If we wanted to live in a town, we would, but we love village life. This would be horrendous." Leader of Oxfordshire County Council, councillor Keith Mitchell, said: "If this proposed 'eco-town' was built, it would be as large as its rather older neighbour, Bicester. "However, the Weston 'eco-town' would be bright, shiny and new while Bicester would still be trying to come to terms with its huge housing growth and a low-wage and low-skill economy that is severely under-developed. "Secondly, the developers promise huge infrastructure investment. "Our initial calculations lead us to believe they simply do not stack up financially and this is something we need to explore very carefully." 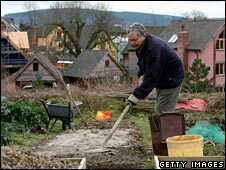 The Berks, Bucks & Oxon Wildlife Trust (BBOWT) said it was "appalled by the government's 'eco-town' proposals". Philippa Lyons, chief executive of BBOWT said: "Whilst we are not opposed to the concept of 'eco-towns', the current plans for this development take in not only our own nature reserve, but also another area of nationally protected grassland and ancient woodland. "If the scheme goes ahead and those sites are included it sends out an extremely damaging message about what the government considers to be 'sustainable development'."